The Virginia Creeper Trail is a 34.3-mile rail-to-recreation trail starting in Abingdon, traveling through Damascus, VA and ending just past Whitetop Station at the Virginia-North Carolina border. This spectacular trail attracts over 100,000 visitors each year to partake of the natural and scenic beauty of this area. The gentle grade and easy access points make the Creeper Trail fun for all members of the family, young and old. Bicyclists feel the wind in their hair as they coast down 17 miles from Whitetop to Damascus. Anglers use the trail to access some of the best trout fishing in Virginia. Equestrians take advantage of the easy footing and wide path available to horses (a code of conduct mandates that cyclists yield to horses so they don't get spooked). Railroad historians search for date spikes and relics from the days when the trail was a working line that hauled people and timber from deep in the southwest Virginia mountains. In 2014, the Virginia Creeper Trail was inducted in to the Rail-to-Trail Hall of Fame. This national honor has only been given to 27 trails. 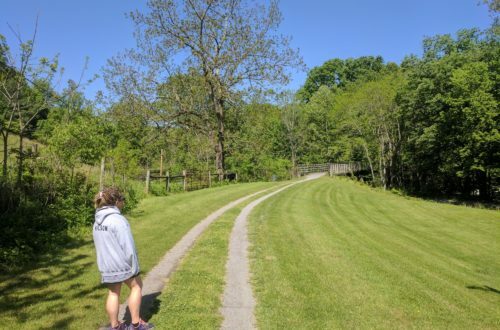 The Rails to Trails Conservancy singled out the Creeper Trail for its remarkable scenery, fascinating railroad history, and excellent trailside amenities. Visit the Virginia Creeper Trail and see why it's a Hall of Fame Trail! Thinking about a visit to the Virginia Creeper Trail? It's one of the most accessible trails you'll find, with plenty of outfitters, lodging and dining nearby. It's equally popular with beginners and advanced riders; multiple entry points mean that you can enjoy an easy 2-hour ride, or challenge yourself with an all-day, 66-mile round trip. Although biking is popular with visitors, don't forget that hiking and horseback riding are also permitted. The most common activity for first time visitors is biking the section from Whitetop down to Damascus. Bike rental companies in Damascus and Abingdon will shuttle you to the top of the mountain for an easy 17-mile coast/pedal down to Damascus. The ride takes anywhere from 2 to 4 hours, depending on your pace. Stops along the way include the old railroad station at Green Cove, operated by the US Forest Service; check out the high trestle at Creek Junction, where the trail runs beside some of the best trout fishing in Virginia; or stop for a bite of lunch in the community of Taylor's Valley. The trail is multi-use, and you'll also see hikers, joggers and horseback riders as you make your way down the mountain. There are 3 visitor centers along the trail: one at the Damascus Caboose, the old Green Cove Station, and the rebuilt Whitetop Station. All are open weekends May through October. Mount Rogers Interpretative Association has a variety of items for sale at each center. The section of the trail from Abingdon to Damascus is wide and level, and winds through rolling farmland. Along this section of the trail, it's not uncommon to see grazing horses and cows. Some might even come right up to the fence to say hello! 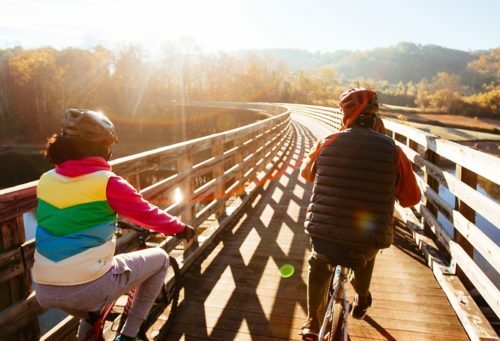 Start your adventure at The Creeper Trail Welcome Center in Abingdon, where you'll find free parking, or contact one of the local outfitters to arrange bike rental and shuttle service to White Top Station. The Creeper Trail Bike Shop is located on Pecan Street, just 2 blocks from the trail head. The shop offers bike rentals, sales and repairs, and a shuttle service. The Martha Washington Inn & Spa offers a shuttle service that is available for guests as well as the general public. Additional outfitters are located in Damascus, VA, a short drive from Abingdon. For more detailed information about the Creeper Trail, visit vacreepertrail.org or request an outdoor recreation guide from the Abingdon Visitors Center. The Virginia Creeper Trail runs on a rail right-of-way dating to the 1880s. In the early part of the last century, the rail line carried lumber to feed the busy sawmills of Virginia and North Carolina. Its name was inspired by the steam engines that slowly crept up the mountainside, although some argue that the name actually comes from the native Virginia Creeper vine that can be found growing along the trail. "Maude Bows to the Virginia Creeper," by the famous photographer O. Winston Link. Copyright History Museum of Western Museum. 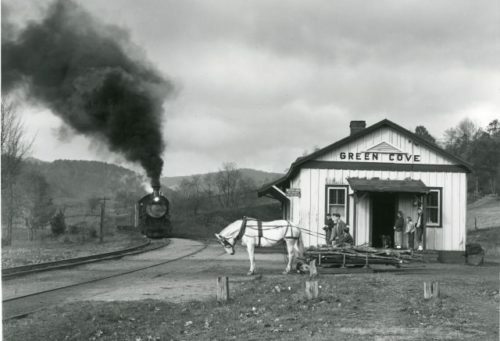 The Creeper Trail is celebrated in a series of photographs by the famous photographer O. Winston Link, including "Maude Bows to the Virginia Creeper," which juxtaposes an old way of life with the oncoming changes brought by the steam engine. As of spring 2017, you can visit an exhibit of O. Winston Link photographs at the Virginia Creeper Trail Welcome Center, courtesy of William King Museum of Art in Abingdon. By the 1970s, many railroads were abandoned so the Rails-to-Trails Conservancy began converting old railroad beds into trail systems for hikers and bikers. After the last train ran the route in 1977, the idea for The Creeper Trail was born, and it was completed in 1984. Much of the trail goes through private land. In many places, the public trail corridor is only 80’ wide. It is maintained by public-private partnerships between the U.S. Forest Service, the Towns of Abingdon and Damascus, and volunteers with the Virginia Creeper Trail Club.